On Friday and Saturday, Oct. 5-6, the Sun City Carolina Lakes (SCCL) Pickleball Club held a 24 Hour Fund Raising Marathon. Two members of the Club, which is hosting a tournament later this month to raise funds for Hope For The Warriors®, came up with the idea to raise some extra cash. The result was a weekend of fun and fellowship and a significant head start on reaching the Club's fund raising goal of $10,000. 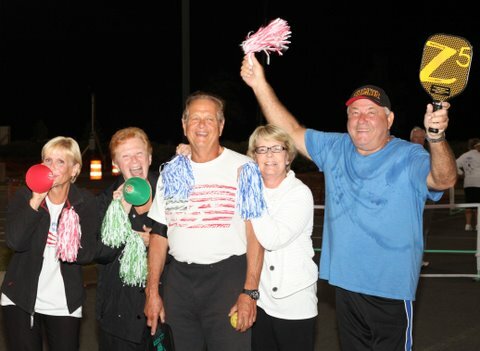 The plan was to have participants keep pickleballs in play, non-stop, for 24 hours. People readily agreed to pay to play and signed-up for 2 hour time slots to be sure there were no gaps in marathon play. All of the available time slots were filled, and, incredibly, the 2-4 AM slot filled first! A total of 119 participants joined in. 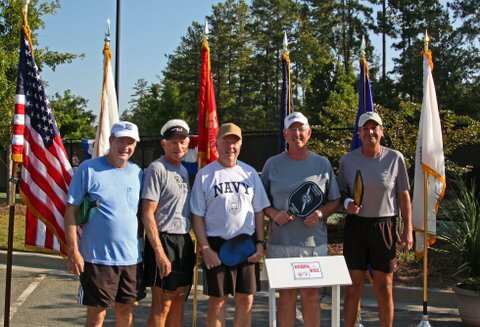 The marathon began with an opening ceremony and tribute to our member veterans. The courts were decorated with flags from each branch of the military and red, white and blue bunting. Veterans, only, played in the first time slot. During open play, beginners were encouraged join the fun, and more seasoned players volunteered to mentor them. The marathon planners had realized folks could not play on the official community courts after 10 PM, because the pop, pop, pop of the picklballs (music to OUR ears), might not be appreciated by all our residents. 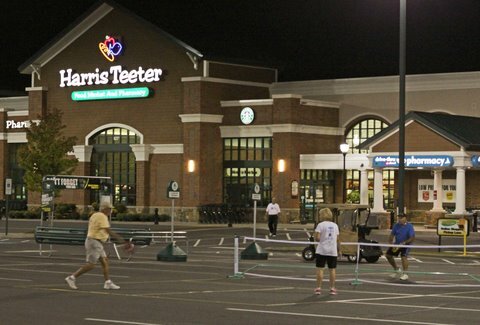 The committed picklers figured the problem was solved when they obtained permission to set up temporary courts in a nearby shopping center. The night owls found the shopping center lighting ideal for evening play. Folks came to cheer them on, including one fan dressed in her bathrobe. 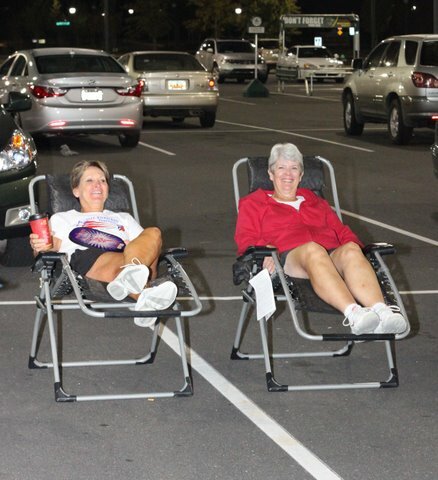 Then, at 12:30 AM, the parking lot lights timed out! The enthusiastic players kept on, however, using bystanders' car headlights. It became a challenge to keep one's eye on the ball with minimal lighting! Fortunately, the lights were eventually turned back on. A number of participants even caught 40 winks in one of the new cars on display from our sponsors. At 6:00 AM play moved back to the official courts, with veterans again playing in the final time slot to close out the event. The Marathon was a lot of fun and many new players joined with the more seasoned ones to help with a great cause. The event generated lots of interest with folks from local TV channels 19 and CN2, and a reporter from the Gateway weekly newspaper, coming out to do stories. Entry fees, a raffle for a specialty paddle, and t-shirt and bag sales netted over $2000, launching the Club well on the way to their goal.